The lion rampant, proud symbol of Vlaanderen. WWI. The Western Front sliced straight through Flanders . Today the Paris-Roubaix traces the front starting in Compiegne . (Click picture for larger version). Compiegne , June 21, 1940. Hitler preparing to accept French surrender. The "Hell of the North". No-man's land. The Ronde Van Vlaanderen (Tour of Flanders) is the most important race on the Belgian calendar. For the Belgian people it ranks above the World Championship RR in prestige. Such is its long and storied history, that each year ‘race day' is an unofficial national holiday. Paris-Roubaix, the Queen of Classics, is usually held one week after the Ronde, with Ghent-Wevelgem sandwiched between the two. Each of these three Classic races feature horrific stretches of cobbles and will more often than not be treated to foul weather with powerful and bone chilling winds blowing in from the North Sea . The Ronde Van Vlaanderen and Paris-Roubaix ( ‘Hell of the North' ) are synonymous with the great Northern Classics. For Americans it is very hard to understand that for a rider to be known as the Lion of Flanders is the ultimate compliment and one that Johan Museeuw carries with great pride. To fully appreciate these facts you need to go back to around the 12th Century. This was the time of the crusades. It was a time when the lion passant (the descendant of the dragon) became the symbol of pagancy and rebellion against the church. The lion rampant became the symbol of Christian knights. The authority that actually adopted the lion rampant symbol in Flanders is open to speculation, and the many romantic stories surrounding the symbol perpetuate the legend. The lion rampant, a potent and evocative symbol, became a favorite in heraldry design. In this case the symbol fit well with the triangular shields of the period. Over time the lion, a black beast on a yellow background, became the symbol of Flemish people. The lion rampant represents the pride of the Flandrian people and Johan Museeuw is their epitome of a great and noble Flandrian. Most people think of Flanders and Belgium as one and the same, but Flanders actually comprises the flat coastal plains that stretch from Holland (The Netherlands) down to an area of France between Calais and Dunkirk . Inland the region stretches back about 60 miles and extends just beyond Brussels . Within today's Belgium , Flanders represents about half of the country; the other half is the French speaking Walloon region, which is best known to cyclists for the Ardennes . This area is known for 2 Northern Classics of its own, the Liege-Bastogne-Liege and Fleche Wallonne classics. Flanders (Vlaanderen in Flemish) continues south over the border from Belgium and into France to become Flandre. This portion of Flanders occupies the two French ‘departments' that comprise Nord-Pas-de-Calais. Historically Flanders is noted for its culture, art and textiles. In Belgian cities like Ghent and Bruges magnificent architecture from the 16th and 17th centuries survives in abundance. Just over the Belgian border in French Flandre lies Roubaix , another city noted for its art and culture, as well as being the textile capital of the world. If we move south to the start of Paris-Roubaix, the historical and geographical links now become clear. The Queen of the Classics actually starts in Compiegne about 50miles north of Paris . Compiegne was the site of the humiliating German surrender on November 11th, 1918 to end World War 1. 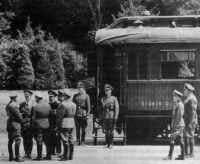 Interestingly Hitler accepted a vengeful surrender from the French June 21, 1940 on exactly the same site and in the same railroad car. From Compiegne the race heads about 100km northeast to Troisvilles and its first appointment with the ‘pave' (cobbled roads). This journey traces almost exactly the line of the Western Front from the Great War (WWI). Starting from the coast between Dunkirk and Ostend , the front went south towards Compiegne before curving off in an Easterly direction through Verdun and on to Germany . The race continues north along a sinuous route to the finish over the ‘Hell of the North' . Contrary to popular belief, the term ‘Hell of the North' was not coined to describe the infernal nature of Paris-Roubaix race. Rather it was first used in 1919 when the race resumed after the war. At the time the landscape was nothing but craters, devastation and mud resulting from one of the biggest catastrophes in human history. The Paris-Roubaix race route passes right through these killing fields with names like ‘The Somme', ‘Arras' and ‘Vimy Ridge' in France and, just over the border from Roubaix, Ypres and Passchendaele. When journalists and race followers first saw this landscape in 1919, it was described as the ‘hell of the north' . In centuries past Spain , Austria , France , Germany and the Netherlands variously occupied the whole region. After the defeat of Napoleon at Waterloo (just south of Brussels ) in 1815 Belgium was handed over to the Netherlands to rule. The Belgians did not take kindly to this and following a major revolution they finally, after centuries of external rule, took control of their own country on January 20, 1831. So modern Belgium includes parts of Flanders while the Hell of the North generally refers to the WWI ravaged landscape of the French portion of Flandre. About 85 years have passed since the Great War but still the gruesome remains of that great struggle are still regularly uncovered. Just a couple of years ago the Paris-Roubaix route was diverted from an area where about 50 tons of WWI poison gas containers were being delicately removed. Farmers are continuously unearthing shells, weapons and human remains.